The Cisco Aironet 1250 Antenna is the first enterprise-class access point to support the IEEE 802.11n draft 2.0 standard that provides the versatility, high capacity, and enterprise-class features demanded by wireless LAN customers. It is a modular, dual-band access point with a choice of 2.4-GHz and 5-GHz IEEE 802.11n draft 2.0 radio modules. 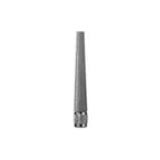 The Cisco Aironet 1250 Antenna is designed for challenging RF environments such as factories, warehouses, and large retail establishments.